Turn onto Avent Ferry from Western Blvd. Turn left at the 2nd stoplight onto Varsity Drive (0.5 miles). Take the fourth right onto Main Campus Drive. 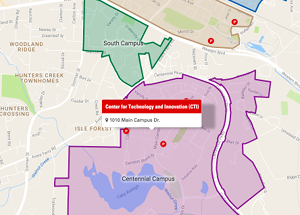 The Center for Technology and Innovation (CTI) is on the corner of Research and Main Campus drives. If you have an NC State permit, there are some spaces available in the vicinity. Anyone (employee or visitor) is allowed to park in the designated handicap spaces with a valid handicap permit. Enter the CTI building from Main Campus Drive (and go to the second floor), Suite 220. Please talk with your contact at DELTA prior to arriving for specific directions.